There are many factors that contribute to the curb appeal of your property. A well-manicured lawn is a great start, as are sparkling clean driveways and sidewalks (did we mention our awesome power washing services?). But with a doubt, the star of the curb appeal show is the house itself. All of the other elements on your property can be immaculate, but if your house looks dirty and worn out, then the curb appeal of your home suffers. Unfortunately the elements here in Tyler, TX can work against the curb appeal of your home. Strong UV rays from the Texas summer sun coupled with thunderstorms that drop up buckets of rain and whip up dirt and debris can negatively impact the appearance of your home. Paint that was once bright and vibrant can appear dull and faded. Dirt, mildew, and other organic growth can start to spread out over the exterior walls of your home making it look, well, dirty! So to keep these threats at bay Poseidon Power Washing offers the perfect remedy to a dirty home – our soft wash house washing service! Protecting the long-term quality of your exterior is a priority, as you want your home to create a crisp first impression now and well into the future. When you invite Poseidon Power Washing to your home, you’ll never have to deal with cracked siding or water damage that results from the high pressure house washing solutions of our competitors. Our team is driven by the philosophy that superior results should be accessible and dependable. We’re proud to serve our customers with solutions that are achieved without interrupting your busy schedule. No matter what your siding type: brick, stucco, or vinyl our soft wash house washing service is the perfect way to amplify your curb appeal. 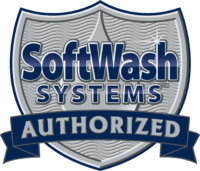 Utilizing our state of the art equipment and industry leading cleaning techniques, our house wash service will deliver a longer lasting clean than our competitors. That’s quality that you can count on! To explore how Poseidon Power Washing can take your curb appeal to the next level, call us or click the button below to get your free estimate today!